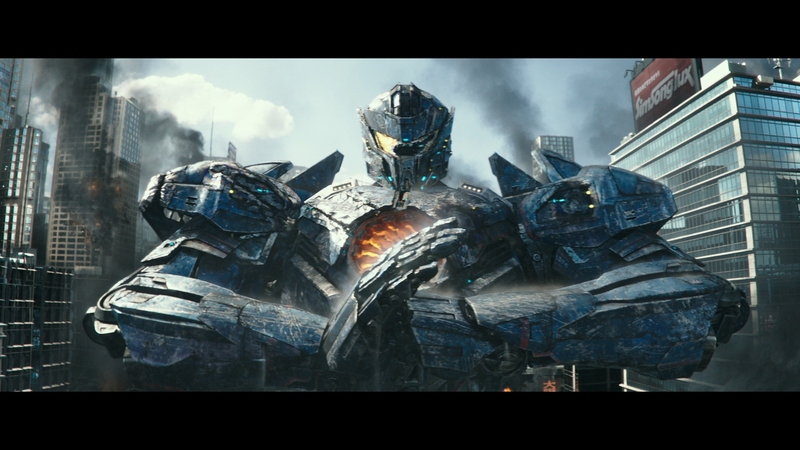 Only call this movie Uprising as Pacific Rim barely exists in the core of this script. It’s bright, cheerful, and dull. The jumble of ideas barely collect into something intelligible and the lore is wrecked. Now it’s an expensive Power Rangers knock-off. 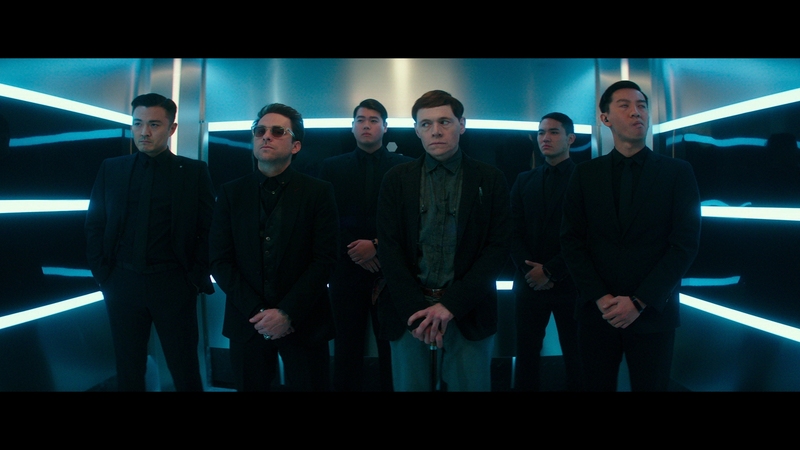 The sense of international cooperation is gone as is the style imbued in the original by Guillermo Del Toro. This is an awful film without sci-fi credibility or logic. 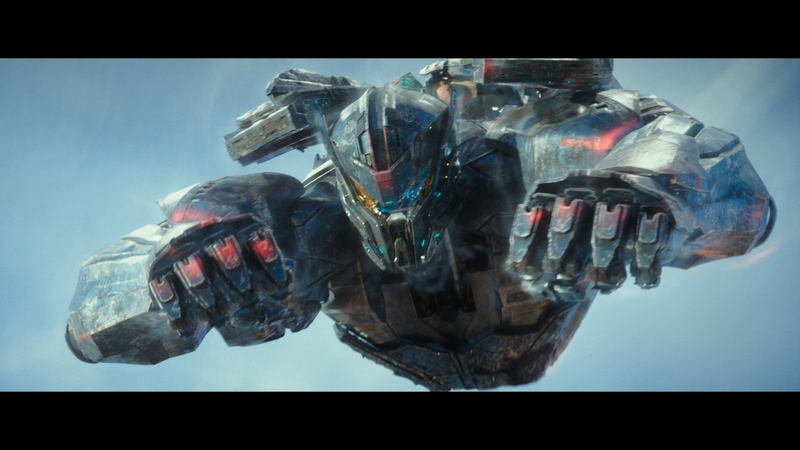 Read our full review of Pacific Rim: Uprising for more. While it’s a nice joke to consider a transfer’s “retina burning” capability, that’s not a gag here. 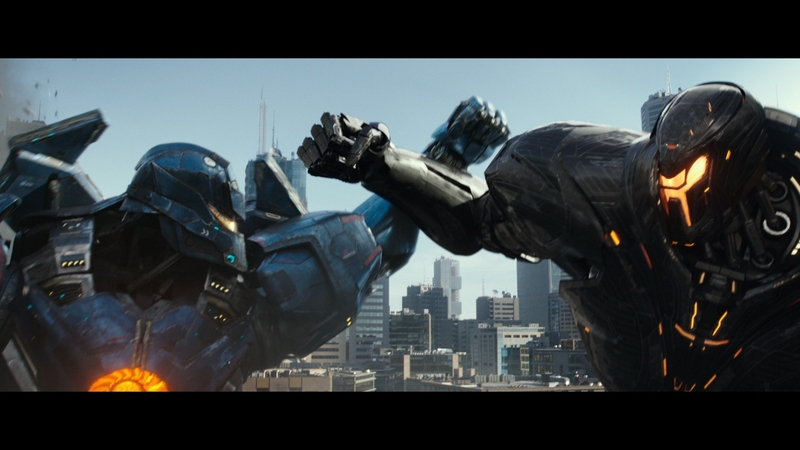 Pacific Rim: Uprising’s unreal brightness stings, easily one of the heaviest contrasts on this format. The Dolby Vision pass gives additional zing to already searing skylines. Passing the sun only delivers more hurt. If you watch in a dark room, be careful. Highlights succeed too. The collection of holographic displays always push the HDR to the forefront. Brilliant lights as the camera pans over nighttime scenery match the intensity of various explosions. Oranges flare up with incredible might. And color? This is a living rainbow collage, doused with every primary and astonishing saturation. Each frame pushes an array, whether there’s a reflection from some display or various robots and their coordinated paint scheme. Hologram displays push further still. Reds, blues, and greens pop as characters call up their interfaces. Pacific Rim: Uprising is a 2K master, but that hardly matters. 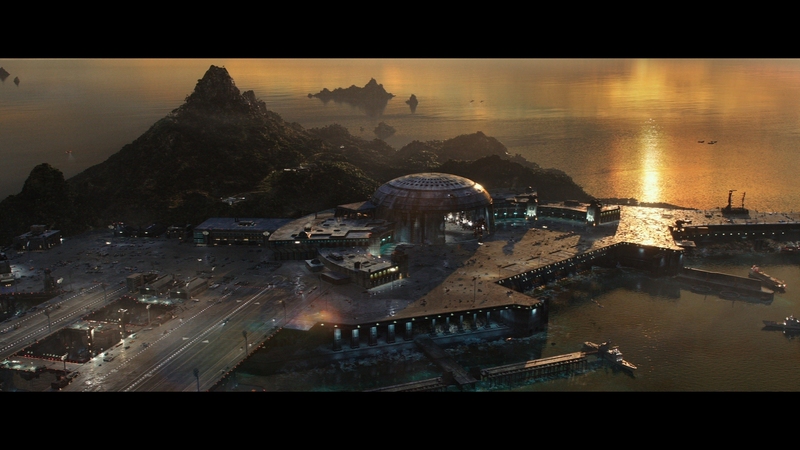 Like the first Pacific Rim on UHD, this showcase allows the format to stretch its legs in other ways. UHD isn’t all about resolution. Still, close-ups and fidelity shine. Looking out over a Japanese city under assault by a kaiju, definition of computer generated environments is sharp enough to pass as 4K. Contrast matters. 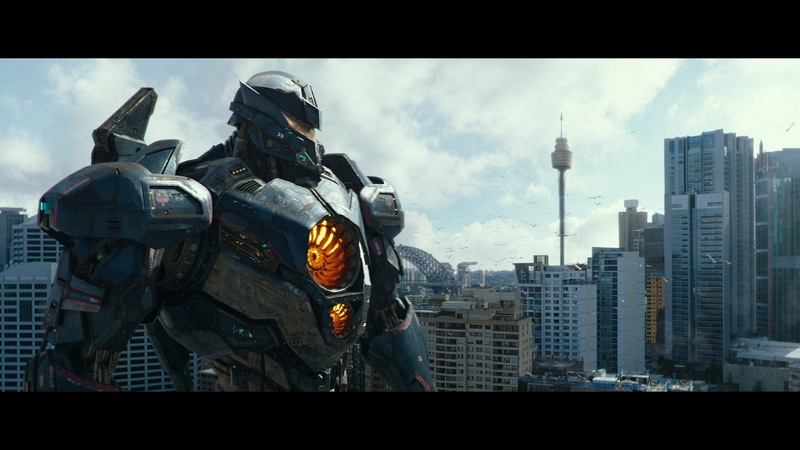 Noise runs through Pacific Rim: Uprising, a buzzy artificial grain that never connects as intended. That’s the lone issue in a stellar, reference tier disc. Intensity varies. Universal’s encode doesn’t appear to add anything additional like compression. 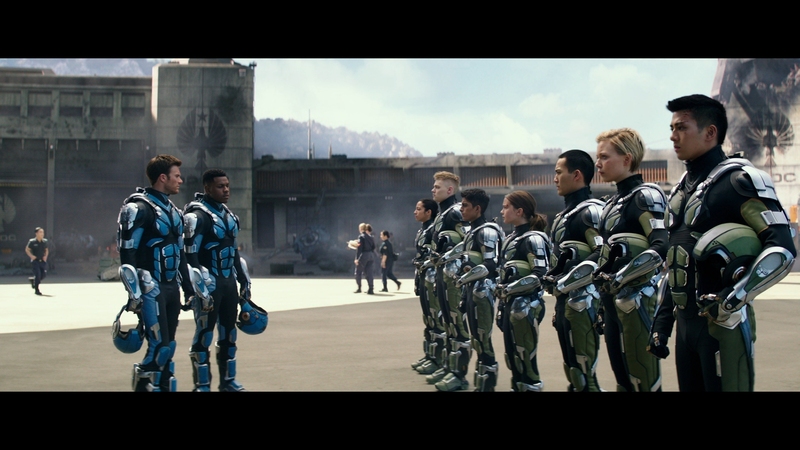 While Pacific Rim: Uprising’s Blu-ray loses the image density of the UHD, for this format, everything works. Dominant contrast delivers weighted depth. Black levels hammer home dimension. 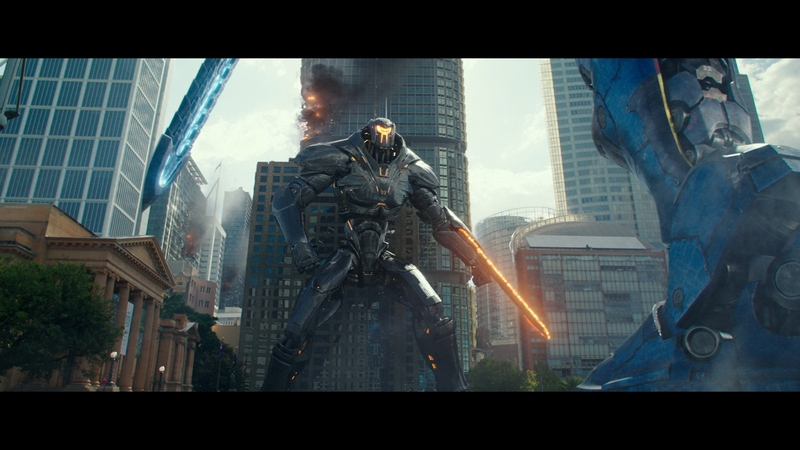 High-grade detail uses high sharpness to its benefit, managing to resolve the fine lines of Japanese skyscrapers during the climatic battle and small touches on the Jaegers. Noise is a bother, albeit a generally minor one. Spikes do erode fidelity. The encode can’t keep up. 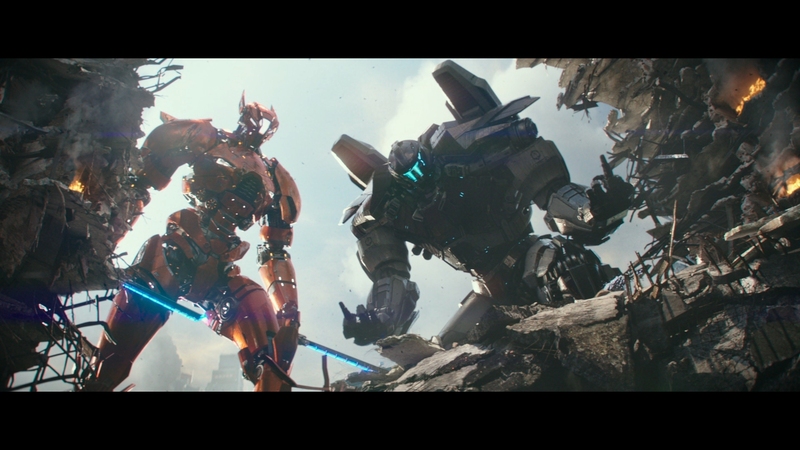 Those flubs aside, Pacific Rim: Uprising is every bit the looker here. While this Atmos mix doesn’t reach the sheer power of its predecessor, that’s hardly a dig. Bass maintains a hyperactive style, thundering and massive. Scale is audibly matched to the visuals. Jaeger footsteps slam down with awesome thrust. 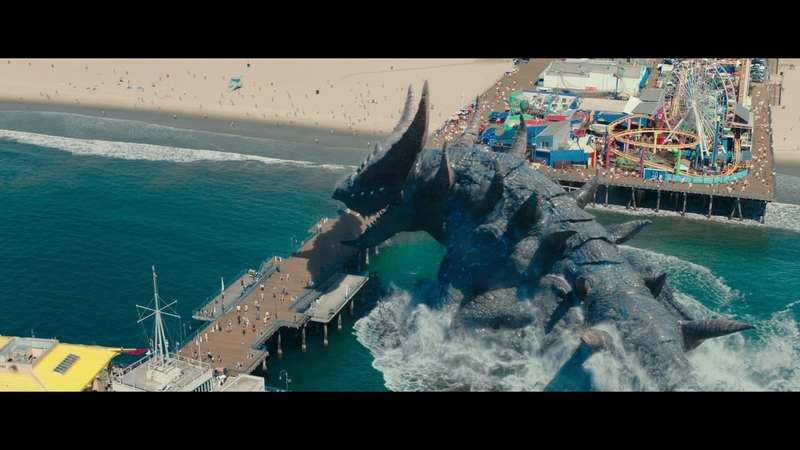 Kaiju roars rock the same way. Explosions flow from the subwoofer, producing outstanding rumble. 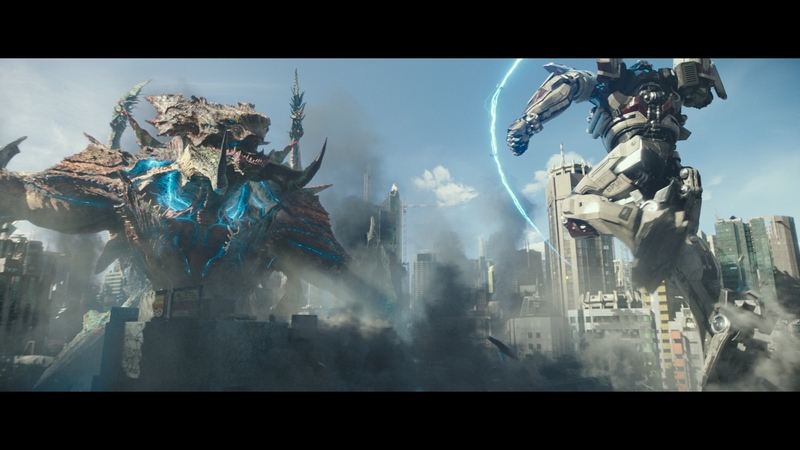 Positioning sends missiles, monsters, and Jaegers around the soundstage effortlessly. It’s clean, with invisble transitions. 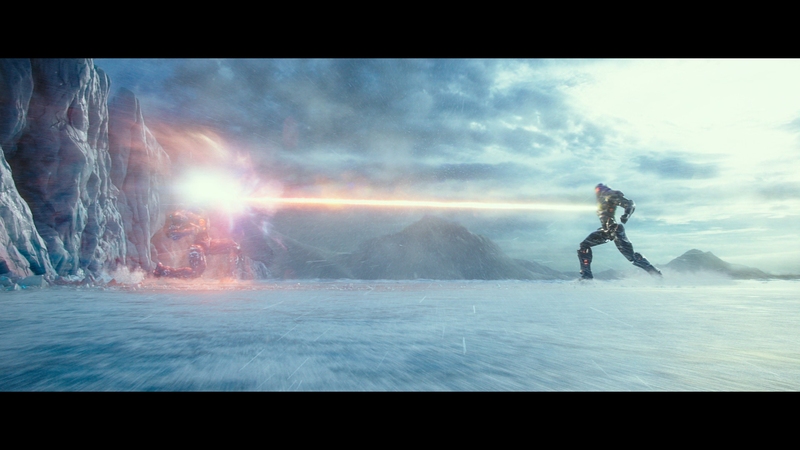 Excellent use of cues make the action scenes dynamic. Monsters and rival mechs sneak up and jump out from a surround. 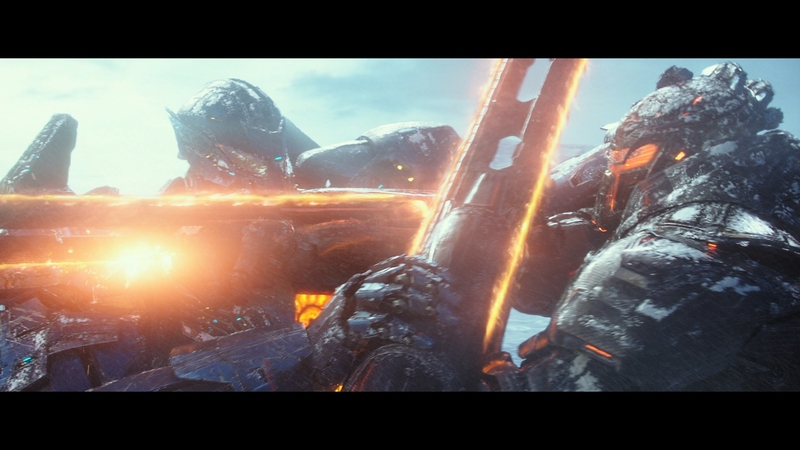 Debris fields fall with accuracy; good thing considering how many Pacific Rim: Uprising uses. Director Steven S. DeKnight pops in for a commentary track, the highlight of the bonuses. Eight deleted scenes run for seven minutes, offering further DeKnight commentary if you so choose. Ten featurettes detail story, characters, and other parts of the movie, but do so without any depth. There’s no reason these weren’t combined or offered with a play all option. Skip them all. 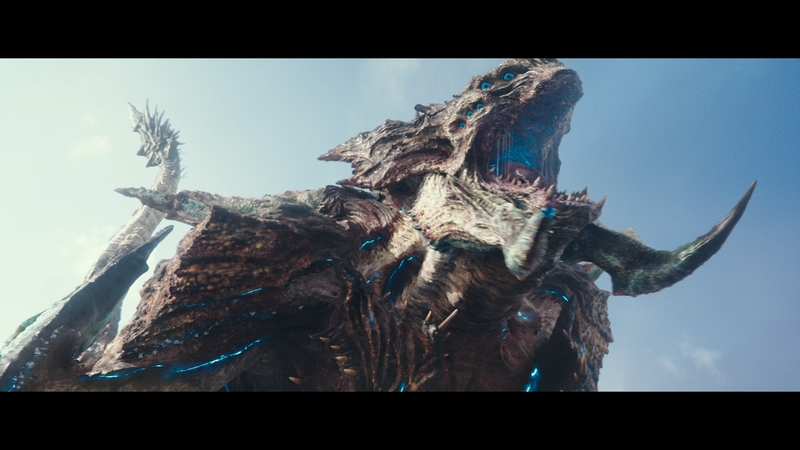 All of the value in Pacific Rim: Uprising lies in the audio/video presentation because the movie itself is a dried out husk of the original. The 15 unaltered images below represent the Blu-ray. 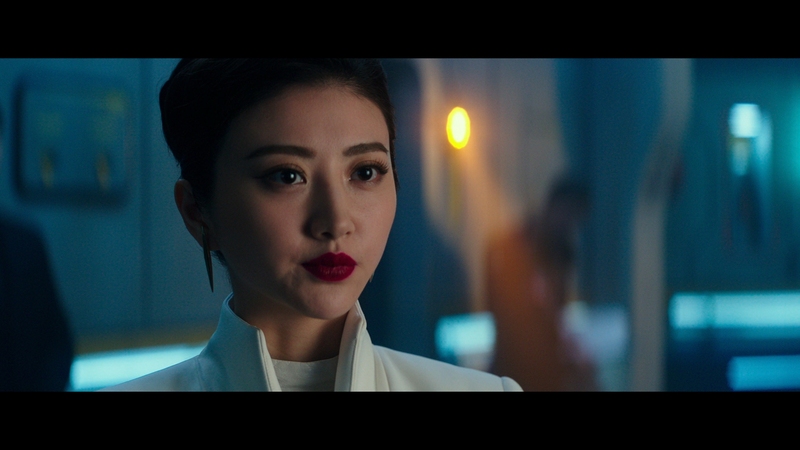 For an additional 38 Pacific Rim: Uprising screenshots, early access to all screens (plus the 13,000+ already in our library), 50+ exclusive 4K UHD reviews, and more, support us on Patreon.